As we count down the days for the FXOpen Drift Series Grand Final that’s going to be held on 25th – 27th Match 2010 at the all new motoring facility Speed City KL, lets look back at the last major drift event of 2010, the Formula Drift Malaysia. 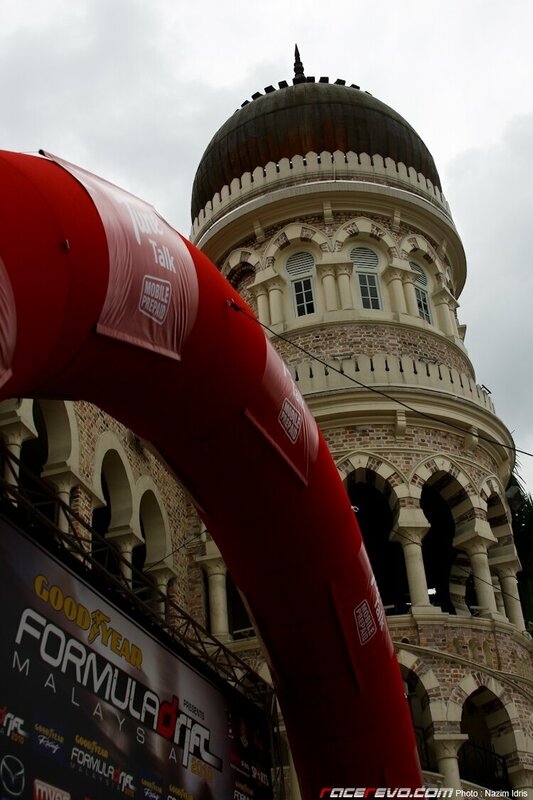 2010 is the 2nd year running that Formula Drift being staged in Malaysia, and for the first time it was organized at the vicinity of the Malaysia iconic Dataran Merdeka. The events begins on Friday with the drivers practicing with the new layout drift course, and on Saturday the adrenaline started to pump with the start of the qualifying rounds. Daynom Templeman during autograph session. New Zealander Daynom Templeman tops the qualifying stages with the score of 91.7, ahead of Kohkae of Thailand and Malaysia’s ‘Prince of Drift’ Tengku Djan Ley. Pre favourite former D1GP champion Daigo Saito was fifth in the standing while his compatriot Ryuji Miki had a poor outing by his standard and had to settle for 9th spot. Yoong and his Skyline V8. On Sunday, the knock-out stages gets underway with Templeman and his ‘Bardahl’ Mazda FD3S RX-7 easily dispatch local privateer Kevin Rajoo. 2nd tandem battle was an all-Malaysian affairs between Ee Yoong Cherng and Goodyear Racing’s Hanizam ‘Loyai Hamzah. The sheer power of Yoong’s Nissan Skyline V8 was no match for Hanizam as he pushed his car too much and spun on both tandem runs. Then there was an AE86 head to head with Tan Tat Wei going up against Indonesian youngster Emmanual Adwitya Amandio. The tandem was fast and tight with Amandio delivers the first upset of the day, knocking out one of Malaysia top drifter. Japanese duo Daigo Saito and Ryuji Miki face little problem early on and came through against their opponent Davide Dorigo and Lim Kim Wan respectively. The next four top 32 battles saw 4 Thailand drifters moves to the next round. Wattanaporn ‘Joe’ Phungpearn got a walkover after Lim Zee King car couldn’t be repair in time, and overall championship contender Non Saranon advanced after beating out compatriot Amm Kasom. Kohkae in his Nissan Cefiro A31 entertained the crowd when he knocked out and literally smoked out David M. Feliciano of Philippines while Nattawoot Krerpradab of M150 Overdrive Team a.k.a. Oat Overdrive conjures up another upset, defeating one of the top favourite Ivan Lau of Malaysia. Next up was former Formula Drift USA Pro-Am champion Charles Ng beating Mohd Fazreen Ismail or better known by the local as ‘Along Rempit’. Thai drifter Mai Chaiwat upstaged another Thailand representative Keak Rapee while Indonesian Rhenadi Arinton with his Red GT Radial JAK Drift Nissan 180SX defeating Goodyear Racing last remaining drifter Michael Gan in Nissan Cefiro A31 Skyline makeover, a.k.a ‘Skyfiro’. Biggest upset of the day came when Ser Meng Hui or better known as Ah Fai pulled of a suprise win over championship leader and Malaysia top drifter Tengku Djan Ley. The first run was tight as Ah Fai chase Djan closely, but on the second run Djan caught a hump on the entry of the first clipping point and spun out, handing the victory to Ah Fai. The remaining top 32 clashes saw Hashiguti Anderson of Brazil get the better off another local privateer Muhammad Zaiham Hamdan, Thailand’s Pop Toyota Chaser V8 got a walkover Nazrul Afifi stricken car and rally driver Rifa Sungkar of Indonesia defeating another Malaysian Mervyn Nakamura as the latter crashed his Nissan Cefiro A31 against the side wall, sending it airborne and out of contention. Rifat Sungkar drifting with Djan’s 180SX. In the top 16 knock out stage, Templeman continues his great form as he get the better of Yoong and his V8 Skyline. Meanwhile Ah Fai, sole remaining Malaysian drifter left in competition ease into the top 8 at the expense of Brazilian Anderson. Ah Fai battles with Hashiguti Anderson. Former D1GP champion Miki had no trouble in his tandem battle with 19-year old Amandio and advanced to the next round accompanied by Saito, another D1GP former champion who on the other hand had a tight battle before ousting Joe Phungpearn and his police patrol drift car. Battle between Daigo Saito and Joe Phungpearn. In the all-M150 Overdrive Team duel, Non Saranon easily defeating teammate Oat Overdrive. But that can’t be said of Kohkae and his A31 Cefiro, as he had to use all his skills and knowledge to beat Charles Ng. The first 2 runs were inconclusive so one more time (OMT) was decided by the judges and it all went to the last clipping point before Kohkae edged out Ng. Indonesian duo Rhenadi and Sungkar continues to carry the flag into the next round after both overcame their opponent, Thailand’s Chaiwat and Pop respectively. The first tandem battle in the quarters saw Miki upstaged the inform Templeman. The New Zealander was drifting very close to Miki in both runs but his angle was a little off and the Japanese took his chance and qualify for the semi final. Saito then making sure one of the semi-final will be an all-Japan outing after drfiting his way past Non Saranon. This effectively ended any chance for Non to claim the overall title from championship leader Tengku Djan. Daigo Saito trails Non Saranon. After coming off a tough tandem battle in previous round, Kohkae upped his game considerably and easily despatching Rhenadi out of the competition. And the final top 8 battle saw the end of Malaysian challenge in the competition as Ah Fai was bundled out by Sungkar. The battle was intense and OMT had to be called, but Ah Fai’s car was damaged in the second run and had to concede defeat, much to the dismay of the fans who were chanting Ah Fai’s name throughout the run. First semi-final clash pit Saito against his compatriot Miki. Both had a good leading run, and Saito just edging out Miki with closer and tighter chasing run as well as smooth drifting throughout the course. The second semi-final pitted crowd favourite KohKae against Sungkar. Kohkae drifting was superbly done, and left Sungkar in his wake as the Thai’s speed and angle was better, plus producing a breathtaking smoke from both of his runs. Moving on to the final, it almost looked like a David versus Goliath match as famous Japanese drifter Saito up against the unknown KohKae of Thailand. Both had a great run to the final and the two best drifter of the day squared off to a rousing applause of the frenzy crowd. Onto the first run, Saito giving chase to Kohkae and managed to stay close to the Thai although lacking angle compared to Kohkae. In the second run, Kohkae’s turn to chase and he put on a fine display to get side by side with Saito. But at the last clipping point Saito was slower, resulting in Kohkae nudged the Japanese door and subsequently handing the win to Saito. 3rd place goes to Miki after he won his duel with Sungkar. Meanwhile the overall winner of Formula Drift Asia 2010 was won by Tengku Djan after he collected 199 points from 3 rounds, ahead of Non Saranon and Amandio.